Biomolecular interactions are important for many biological processes; the development of biosensor technologies for the investigation of biomolecular interactions has markedly advanced over the last years. 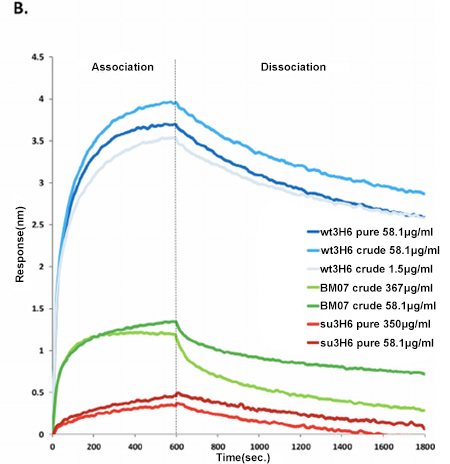 Label-free optical methods like Surface Plasmon Resonance (SPR) and Bio-Layer Interferometry (BLI) have been used in vitro to qualify and quantify protein-protein interactions by studying kinetics of binding and dissociation. 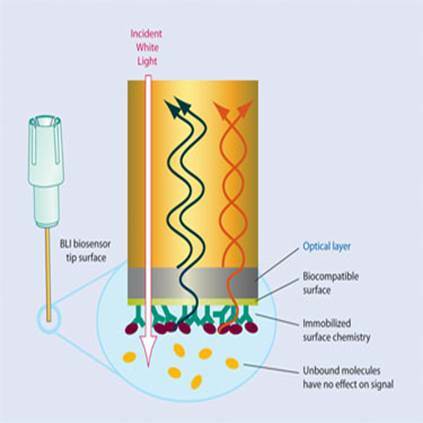 Bio-Layer Interferometry measures biomolecular interactions by analyzing interference patterns of white light reflected from the surface of a biosensor tip. In BLI experiment, one molecule is immobilized to a biosensor and binding to a second molecule is measured. The molecules that bind or dissociate themselves from the biosensor causes a shift in the interference pattern that is measured in real-time. The unbound molecules, variations in the refractive index of the surrounding medium or flow rate, however, do not affect the interference. This unique feature of BLI technology therefore allows measuring crude samples to determine the kinetics and affinity of molecular interactions. Anotheradvantage of BLI is that the number of sensors can be scaled up easily without making the system more error-prone or complex. Theoretically, there is no need to regenerate single sensors, because immobilizing an equal amount of ligand on additional sensors can easily create duplicates of the surface. Creative BioMart assists scientists to accelerate their research progress in a highly productive and cost-effective way. Creative BioMart’s Bio-Layer Interferometry platform provides a one-stop solution for researchers who have expressed interests in macromolecular assembly, membranes, liposome, viral like particles and binding of peptides to proteins. 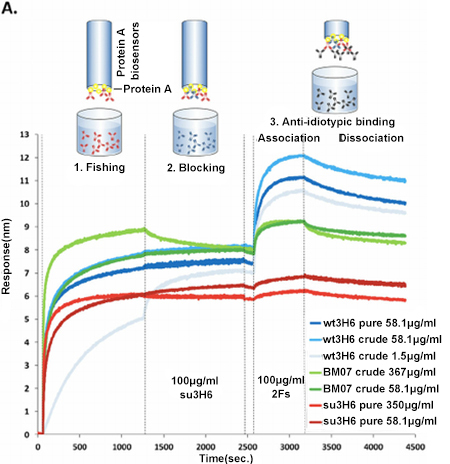 BLI can be applied to a wide pharmaceutical field of protein quantitation, affinity and kinetics analysis, drug/antibody screening, drug/antibody discovery, and optimization of drug process development.